(Mississauga, On) While the Raptors prepare for Lebron James and his Lakers, there was home opener right next door to Toronto. In the City of Mississauga, more commonly known as Sauga, the Raptors 905 hosted their season opener against the Delaware Blue Coats in the newly named Paramount Fine Foods Centre (formerly Hershey Centre). All three Canadians – Myck Kabongo, Duane Notice and Chris Boucher – saw court time; 12:56, 29:55 and 35:51 minutes, respectively. 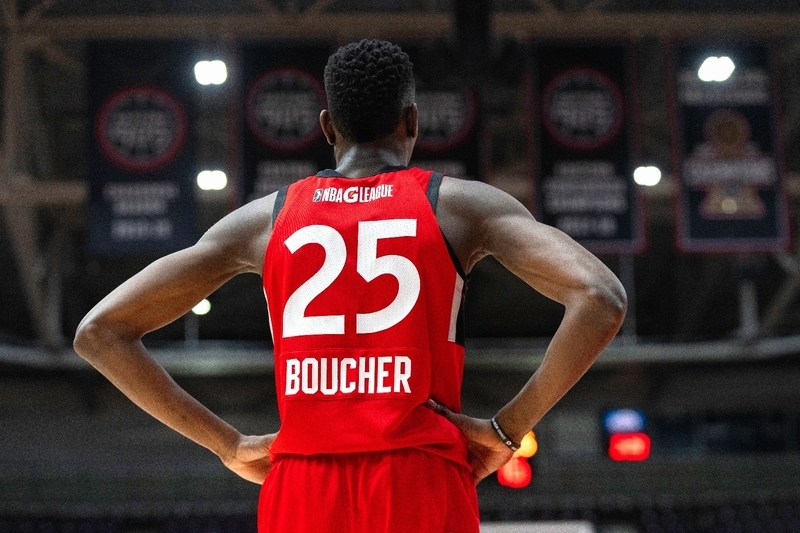 Boucher, the Raptors two-way player from Montreal, has already seen a sliver of NBA court time against the Milwaukee Bucks, and yesterday afternoon, he let his game do the talking. His game screamed NBA-ready, finishing with a monstrous 33 points, 14 boards (six offensive rebounds), four assists, three steals and three blocks. There was nothing Boucher couldn’t do. “I’m obviously part of the (Toronto Raptors) and when they need me, they’ll call me. I’m focusing on what I have to do here,” said Boucher about his urgency to play with the parent team. The 905 trailed 36-32 after the first quarter. Led by Boucher and Notice, the 905 outscored Delaware 40-29 in the following frame. It was a back-and-forth affair for the majority of the quarter, but Boucher led his team on a 7-2 run to close out the final 90 seconds of the second. Boucher got to the line and made both free throws, completed an and-1, stole the ball, saved a loose ball from going out of bounds, and threw it into Kyle Collinsworth’s hands for an easy dunk. Canadian content on the 905 shined in the second frame; Boucher had 14 and Notice 10. Notice completed an and-1, hit a corner three assisted by Boucher, and made two layups, one after stealing the ball out of Delaware’s passing lanes. The third quarter, however, was a different story. The 905 got off to an atrocious start, Delaware going on a 12-0 run. Norvel Pelle (14 total points on 7-for-8 shooting, 12 rebounds and three blocks) and Demetrius Jackson (34 total points on 50% shooting, 13 assists and six rebounds) scored a combined 11 points. The 905’s weakness, their defensive transition, was exposed. “We gotta get back. We can’t allow so many easy layups at the hoop,” said Head Coach Jama Mahlalela, reflecting on the game afterwards. Despite a weak defensive third quarter, two-way player Jordan Loyd came to life, scoring eight. Loyd, who had the game’s highlight dunk in the first quarter, kept the 905 deficit within four by hitting a triple, a layup, and assisting Boucher’s dunk. With 6:10 left in the fourth quarter, the 905 were down by 10 points, 118-108. Unabated, the 905 fought back in the contest. Notice hit a triple and Boucher followed suit. Though Boucher had a much quieter offensive second half with 11 points, he rose to the occasion when the stakes were high. After stealing the ball, he took the ball coast-to-coast and drew a foul. He made both free throws with 01:52 on the clock, trailing by three points. Deng Adel then hit a clutch three to tie the game 122 apiece. He had a total 17 points on 7-for-11 shooting, three rebounds and two assists. The 905 found luck on their side in the dying seconds as Delaware missed key free throws. Delaware’s Jackson missed a free throw with 37.9 seconds on the clock, and it was still a one-possession game (Delaware led 125-122). Loyd then drew contact and hit both free throws to make it 125-124 Delaware. Down by only one point, Boucher intentionally fouled Delaware’s Haywood Highsmith. Miraculously, he missed both despite going 3-for-3 from the charity stripe beforehand. Delaware forward Jonah Bolden ripped down the offensive board and they took a timeout. But Loyd stole the ball on their inbound play, and drew a foul. He iced a pair of two clutch free throws, giving the 905 in a slim 126-125 lead. 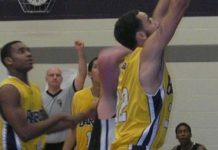 Delaware failed to answer back on the ensuing possession, as the 905 eked out a nailing-biting one-point win at home. The 905 will have four days off before their first game of a back-to-back, and Coach Mahlalela will use this time to study and prepare. “There’s a ton now that we’re going to start to analyze and look (at). And you need a real game to tell you what you really need to work on. So we’ll watch the film and figure it out the next few days,” he said. The Raptors 905 will return home to Paramount Fine Foods Centre on Friday, November 9th. They will tip off against the Long Island Nets at 7:30 PM for Affiliate Night. Some Toronto Raptors players are expected to be attending. Not only was this home opener the first Raptors 905 game for three Canadian players and seven Canadian coaches, including Coach Mahlalela. Former NBL Canada player and University of Ottawa Gee Gees graduate, Warren Ward, also debuted as a colour commentator on the Raptors 905 broadcast team. Portland Trail Blazers shooting guard and Canadian Nik Stauskas has been on air during the NBA offseason. Ward followed similar path, sidelined from playing professionally in Spain due to injury.